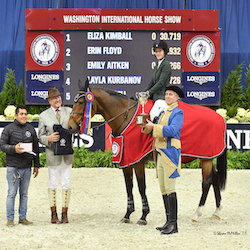 WASHINGTON, October 2, 2015 – As the 2015 edition of the Washington International Horse Show (WIHS) approaches, riders throughout the country who have qualified during the past year for the WIHS Hunter and Jumper Championships and WIHS Equitation Finals are preparing to travel to the nation’s capital to compete in the Finals, which will be held Tuesday, October 20, through Sunday, October 25, at Verizon Center in Washington, D.C.
More than 4,100 riders have been earning points to qualify for such coveted classes as the $10,000 WIHS Children’s Hunter Championship, $10,000 WIHS Adult Hunter Championship, $10,000 WIHS Children’s Jumper Championship, $10,000 WIHS Adult Jumper Championship, WIHS Equitation Finals, and the WIHS Pony Equitation Finals. Lists of all qualified riders and points are available at www.wihs.org/wihs-rankings/. Forty of the nation’s top equitation riders will travel to Washington, D.C. for the WIHS Equitation Finals, one of the most sought after championship titles for junior riders, with 30 spots awarded to riders from the East Coast and 10 from the West Coast. Equestrian talents such as Mclain Ward, Kent Farrington, Hardin Towell, and Brianne Goutal, each currently successful on the international show jumping stage, were recipients of the WIHS Equitation Finals top honors during their junior career. At the conclusion of the qualifying period (Sept. 1 – Aug. 31), Victoria Colvin of Loxahatchee, FL, stands atop the leaderboard with 10,240 total points leading the way for the East Coast entries. Thomas O’Mara Jr., of Rumson, NJ, follows in second with 6,804 points, and Katherine Bundy, representing Westport, CT, holds third place with 4,380 points. 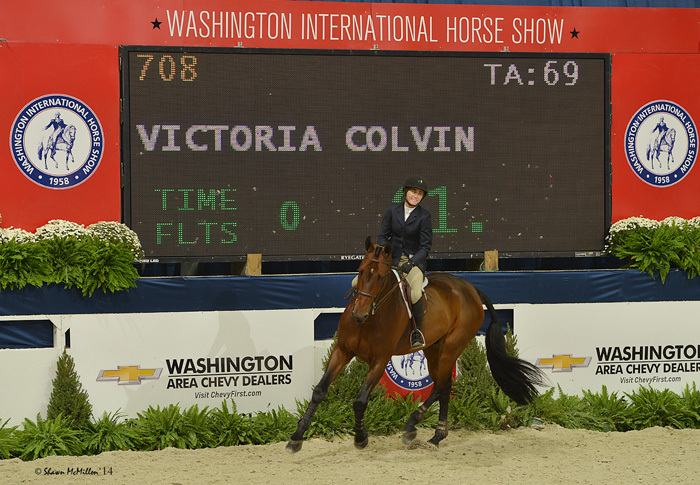 At the end of the 2015 qualifying period, Victoria Colvin of Loxahatchee, FL, is at the top of the WIHS Equitation East Coast leaderboard with 10,240 points. Alexandra Ladove of Rancho Santa Fe, CA, leads the WIHS Equitation West division with 3,254 points, while Hunter Holloway of Topeka, KS, is in second with 2,284 total points. Sydney Hutchins, also from California, rounds out the top three of West Coast qualifications with 2,197 points. The WIHS Pony Equitation Finals will host 25 riders, as Jordan Cobb, of Austin, TX, is the leading qualifier with 749 points. USEF Pony Finals Champion Augusta Iwasaki from Calabasas, CA, follows closely behind with 746.50 points and Ruby Sloan, of McDonough, GA, is third on the leaderboard with 701 points. Samantha Karp, from Wellington, FL, and Zetina B finished as the leading pair for the WIHS Children’s Hunter Championship with 2,448 points, while Lauren Dean, of Great Falls, VA, and Vivaldi qualified with 2,219 points. Elise Buhl from Grosse Pointe Farms, MI, and Veneur, owned by Mockingbird Farm, will make the trip to Verizon Center with 1,822 points. In the WIHS Children’s Jumper Championship standings, Anna Claire Smith of Atlanta, GA, and Bilbo Baggins lead the way with 3,876 points, while fellow Georgia resident Isabel Harbour of Alpharetta and Captivate are in second on 3,800 points. Kathryn Hall of New York, NY, and Opera round out the top three with 3,467 points. The WIHS Adult Jumper Championship standings are led by Lindsey Tomeu of Wellington, FL, and Bonapart with 9,089 points. Tegan Elizabeth Treacy of Needham, MA, and Catalyst are next in line with 5,005 points. Dean Dignelli of Katonah, NY, and Redefin are in third with 3,918 points. Leading the WIHS Adult Hunter Championship standings are Mindy Wurzburg and Overseas with 2,575 points. Wurzburg hails from Memphis, TN. From Arlington, VA, Rachel Howell and Swington are in second with 1,814 points, and Hunter Kay of Charlotte, NC, is in third with Briland on 1,792 points. The WIHS Children’s Hunter Championship is first of the finals series, taking to the ring on Tuesday afternoon, October 20, followed by the WIHS Adult Hunter Championship, Tuesday evening. The WIHS Children’s Jumper Championships will be held on Wednesday afternoon, October 21, and WIHS Adult Jumper Championship will be held that evening. The WIHS Equitation Finals will be held in three phases starting on Friday afternoon, October 23, with the Hunter Phase followed on Saturday afternoon, October 24, with the Jumper Phase. The final work-off will be held Saturday evening when the top 10 finalists ride off for the title. The WIHS Pony Equitation Finals will be held on Sunday, October 25. WIHS has created a one-of-a-kind competition series for equestrians of all ages. As WIHS prepares to host this year's finals, competitors hoping to qualify for next year have already begun earning points at more than 700 shows nationwide. Although WIHS membership is not required to compete in the qualifying classes, competitors must be WIHS members in order for their points to count towards the finals. Sign up today to become a WIHS member and start earning points to qualify for the 2016 WIHS Hunter and Jumper Championships and WIHS Equitation Finals in Washington, D.C. The qualifying period is September 1, 2015, through August 31, 2016. For more information about qualifying or to sign up for membership, visit www.wihs.org/wihs-championships. Established in 1958, the Washington International Horse Show is one of the most prestigious equestrian sporting events in the U.S. More than 26,000 spectators attend the six-day show, which includes Olympic-level competition along with community and charity events. More than 500 top horses and riders come to D.C. from all over the globe to jump for more than a half a million dollars in prize money. Event highlights include the $125,000 Longines FEI World CupTM Jumping Washington, presented by Events DC, for the President’s Cup (Saturday night), The Boeing Company Puissance high jump competition on Military Night (Friday) and Kids' Day (Saturday), a free, fun and educational community event. The Washington International Horse Show Association, Ltd. is a 501(c)(3) nonprofit charitable organization headquartered in Washington, D.C. WIHS is an official USEF Heritage Competition and is recognized as a Top 25 Horse Show by the North American Riders Group. WIHS is rated CSI4*-W by the Fédération Equestre Internationale, the world governing body for horse sports. Photos copyright Shawn McMillen Photography. They may only be used in relation to this press release and with photo credit.